Factory fit for your Honda! These Bar End Weights are machined out of Billet Aluminum. They are shaped similar to OEM and will fit most Honda's without any modification (see list below). 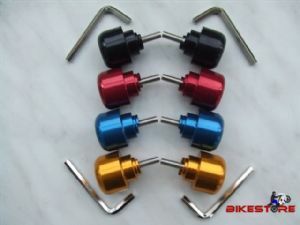 These Honda Bar End weights are sold as a pair and available in a Black, Red, Blue or Gold anodised finish. Please request colour when ordering.